Senior Pacific Curator Sean Mallon gives a short environmental profile of Tokelau and finishes with one of Tokelau’s creation stories. Tokelau comprises of villages on three main low-lying atolls – Atafu, Fakaofo, and Nukunonu. The actual land rises only a few metres above sea level. 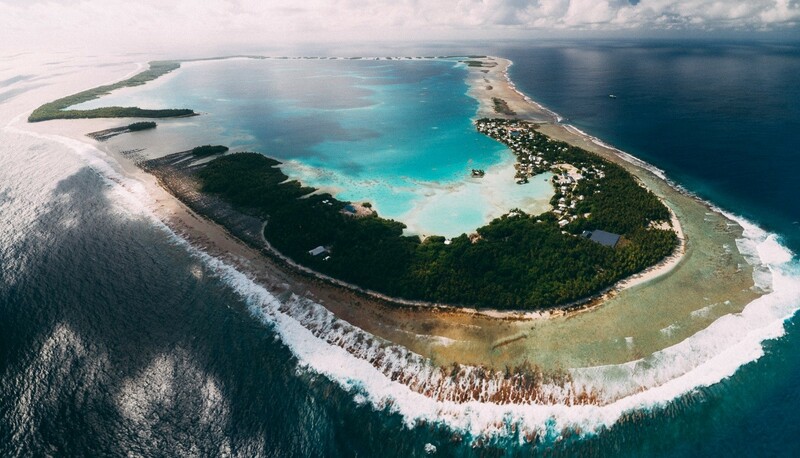 A low coral atoll is formed from a coral reef that has grown on top of a submerged volcano, so the three main islands of Tokelau all sit on extinct volcanic peaks. This land consists of sand and coral that has built up on the surface of the reef. Low coral atolls like Tokelau have no surface fresh water. People had to dig wells until a lens-shaped natural reservoir of fresh water trapped beneath the sand. This precious resource is replenished by rain. 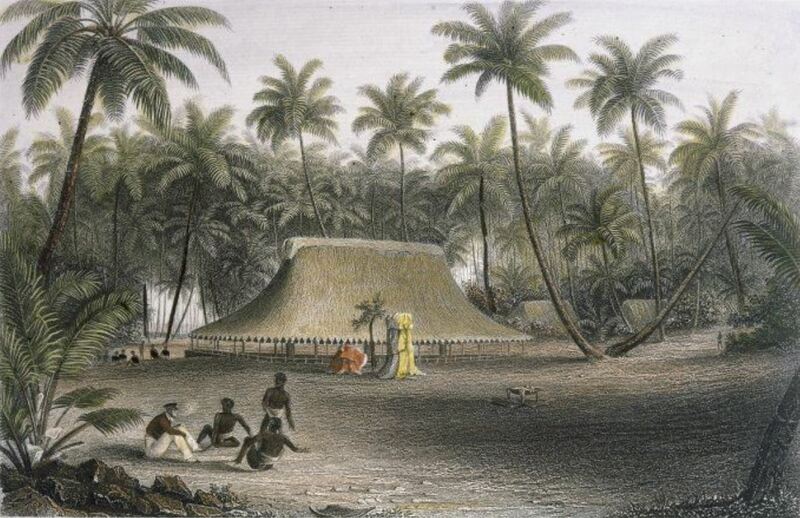 For food, in earlier times Tokelauans depended on the native pandanus and coconut trees, as well as introduced plants such as swamp taro (which they grew in ponds dug down to the freshwater level) and breadfruit. Marine resources and activities like fishing were also vital. Tokelau people have developed a unique system of sharing out food among all members of the community. This is called inati. The only ‘rock’ in Tokelau is coral, so the people used shell and bone for tools. Occasionally they obtained stone tools from other islands, like Samoa. 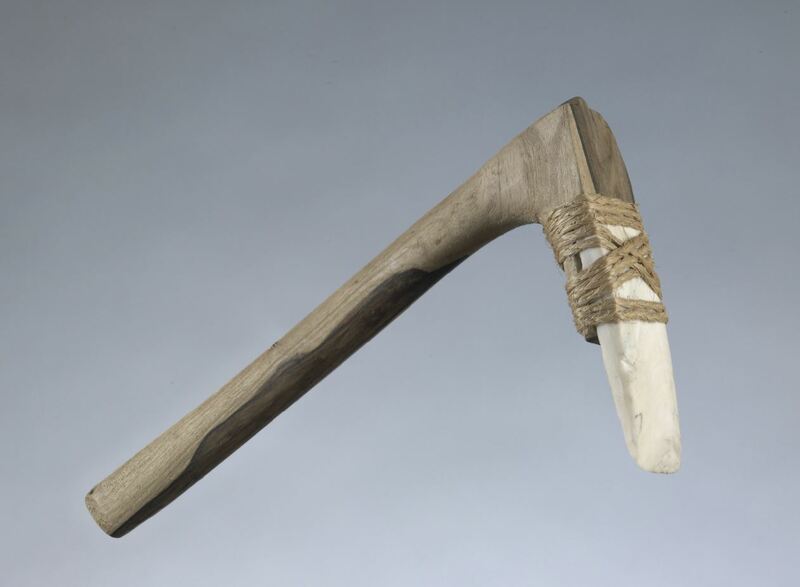 This adze’s handle is modern, but its blade is of a type used by generations of people on low coral atolls. For many Pacific toolmakers, clam shells made a good alternative to stone. Three brothers lived in Tonga. Their names were Mauimua, Mauiloto, and Mauimuli. They were out fishing one day when Mauimua’s hook caught on the roots of a coconut tree at the bottom of the sea. When he tried to free his hook, he pulled up an island. All three brothers were amazed, and called this island Fakaofo – ‘surprise’. Later, Mauilotu’s hook caught on the roots of a nonu tree. He pulled up another island, and the brothers named it Nukunonu. Finally, Mauimulu’s hook caught on the roots of a kanava tree. The island he pulled up was full of kanava trees. The brothers called it Atafu. Na iei te kau uho e toka tolu na ola ake i Tonga. Ko o latou igoa ko Mauimua, Mauiloto ma Mauimuli. Na fai to latou faiva i te tahi aho oi lave ai te kafilo a Mauimua ki ni aka e o he niu nai te takele o te tai. Kae taumafai ia ke fakato tana kafilo, na ia fufutia ake ki luga he fenua. Na ofo lele te kau uho, oi fakaigoa ai e ki latou te fenua ko Fakaofo. Fai fai lava to latou faiva kae lave te kafilo a Mauiloto ki na aka o he nonu. Fufuti ake ki luga tana kafilo ko he tahi fenua, ma na fakaigoa e ki latou ko Nukunonu. Mulimuli ake, kae lave te kafilo a Mauimuli ki na aka o he kanava. Ko te fenua na ia fufuti akea ki luga e tumu ina kanava. Na fakaigoa ai e ki latou ko Atafu. Around 6,819 Tokelauans now live in New Zealand. There are small communities in locations such as Samoa, Hawaii, and Australia. well what about olohega how was olohega created?its part of tokelau.